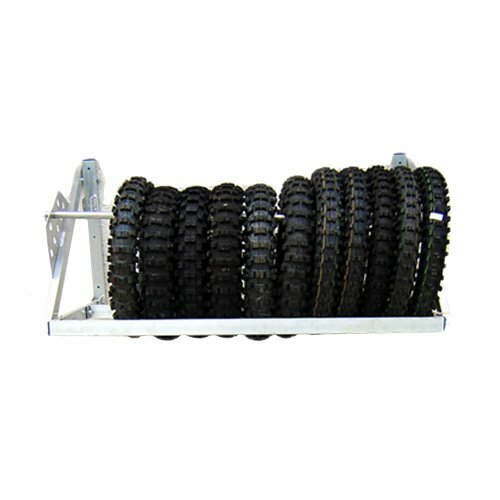 A tire rack is a storage system for RV, ATV, and standard vehicle tires. Their goal is to provide safe, secure, and convenient storage for tires, so you don’t have to pile them up around your garage. After all, they take up a lot of room! There are three main styles of a rack that may appeal to you. The first is a single shelf with room for four tires. You install it on your wall and neatly stack the tires vertically. Then, you can buy tire hooks which hold one individual tire at a time, either flush against the wall or producing outward. Finally, you have a commercial tire rack which has several tiers, and you can access it from both sides. Find out which option suits you well, then check out these options below. You may find it’s not all that challenging to discover a rack to suit your needs. Tires can take up a lot of room, and unless you buy a tire rack, they can end up taking over your garage. Take care of the problem with a tire rack from HyLoft. Instead of piling your RV, ATV, and seasonal tires up in the corner of your garage, you can secure them in place on a wall-mounted tire rack that doesn’t get in the way. Your tires can be out of sight and out of mind until you need them. This tire rack is going to be suitable for a broad range of people. Firstly, it’s 48 x 36 inches, meaning it can hold a whole lot of tires. It also features sturdy steel with a red powder-coated finish. Such a finish means that it becomes resistant to scratches and daily wear and tear. The weight capacity of this tire rack is impressive too, even after you mount it to the wall. It comes with all the hardware you need for installation, and you will have very few problems installing it. However, check the brackets before you begin as they can arrive crooked. 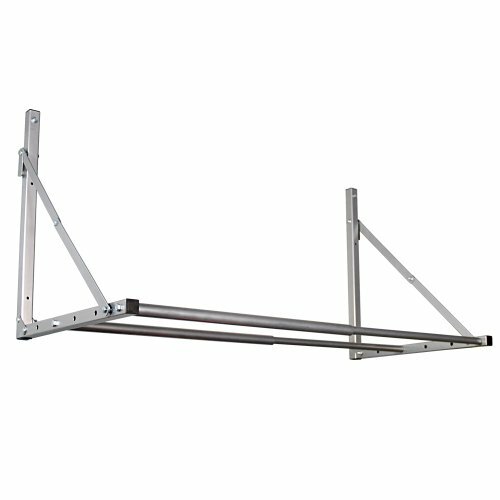 The frame also has sharp corners so install the rack away from your walking area. Even though it’s going to take you a long time to install this tire rack, you won’t mind once you see the final result. It’s a rack that’s going to impress everyone who walks into your garage. 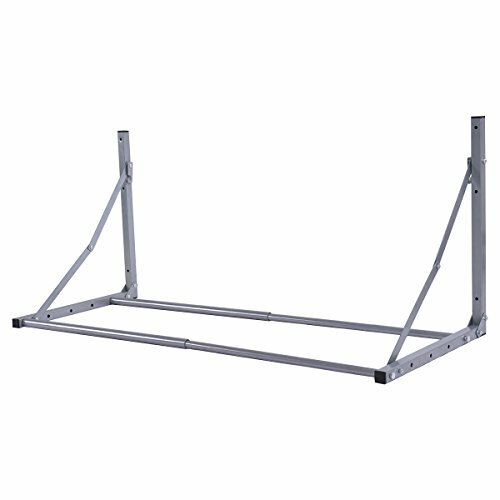 Instead of piling your RV, ATV, and seasonal tires up in a corner, getting in the way, you can buy and install this rack to take care of them all. It features steel construction to handle a lot of weight, and will even hold up to 400 pounds-worth of tires. What’s more, it’s black, so any marks won’t show up on it at all. It comes with all installation hardware, but you may like to check both the pre-drilled holes and the quality of the welding. Sometimes the quality control of this tire rack is not perfect. It’s affordable, installs anywhere in your home, and will ensure you don’t have to trip over your tires any longer. What’s more, it features powder coating so that it won’t rust or succumb to damage. If you’re in the market for an affordable tire rack, this could be an excellent option. If you have regular tires that keep getting in the way in your garage, then you may like to buy this tire rack from HyLoft. While it’s not going to suit pickup truck tires or even large vehicle tires, it will be more than suitable for ATV and regular car tires instead. What will first capture your attention is the price tag. This tire rack is affordable and looks high-quality, which is a rare combination to find. It’s also available with steel construction and silver powder coating, making it look discrete in your garage but look neat and tidy too. Thanks to the powder coating, it’s resistant to scratches and will look as good as new for years to come. It also holds up to 300 pounds of tires – perfect for a whole variety of tires – as long as they are not too tall. If you load it up to the maximum weight capacity, it can also feel quite flimsy. 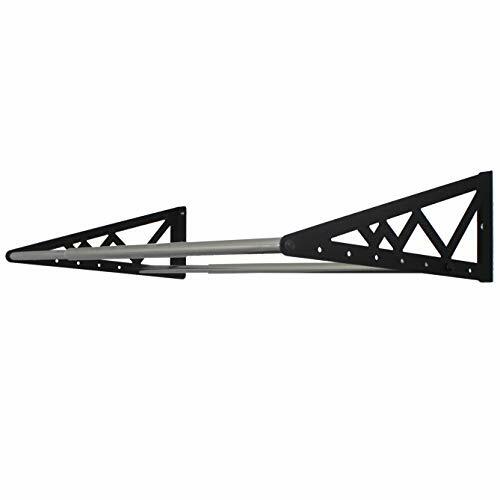 It can be hit or miss whether you receive installation hardware with this tire rack, but given its price tag and quality, it’s a small sacrifice to make. You will enjoy all your newfound floor space. 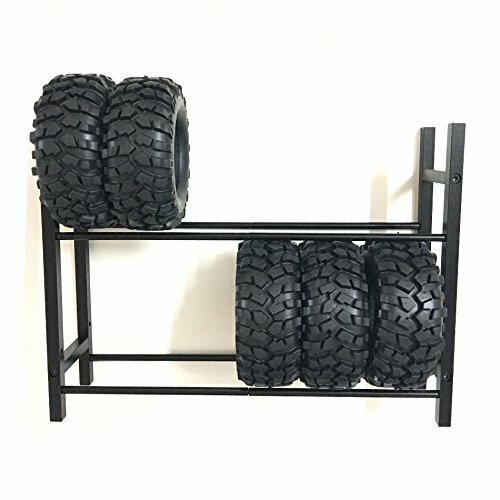 If you prefer to have spare tires ready to go at a moment’s notice in your garage, then keep them out of sight and out of mind with this tire rack from MaxxHaul. Even though it’s at its 300-pound capacity once you load it up with four tires, it will hold them well. It also keeps them off your garage floor to allow more space for your vehicle. This tire rack is going to be a firm favorite in your garage for many reasons. 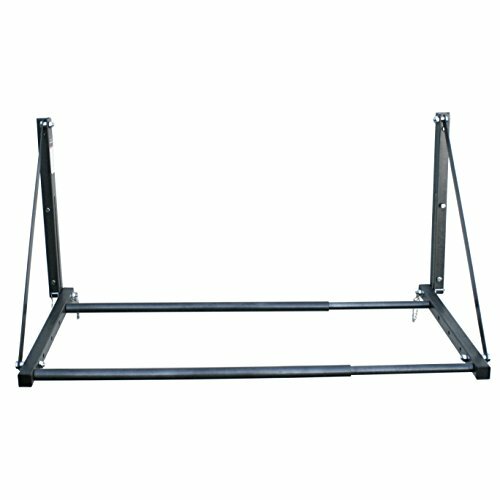 It features robust, steel construction with steel tubing, expands out to 32 x 48 inches and weighs only 17 pounds itself. Then, how unobtrusive it is will also impress. If it’s not holding your four tires, you can fold it flat against your wall, so you don’t smack your head on it! What’s more, this tire rack is affordable and robust and won’t take you all that long to install. However, you may like to invest in new lag bolts as the ones that arrive with it are weak. All in all, if you’re looking for a new tire rack, there’s every reason to consider this one. If your garage is beginning to look a little bit out of control because of all the tires lying everywhere, then it’s clear to see a regular tire rack won’t do. You need something bigger. Or, perhaps your place of business needs more space for tires too? This tire rack can solve both problems. Use it at home or work, and it will safely hold up to 24 tires – no matter how big or small. As a three-tier tire rack, it has adjustable shelves you can move around to suit the height of your wheels. It also features double riveting on the support beams, and plenty of robust steel to go around. For even more convenience, once you assemble this tire rack (which doesn’t take a lot of effort), you can then take tires from both sides. In a workshop environment, this is an exceptionally convenient feature. If you’re worried about the quality of the tire rack because you’ve had bad experiences in the past, then don’t be. It’s made in the United States so you can get peace of mind that it’s quality. Take your garage tidiness back into your hands by purchasing this tire rack from Champ. While you’re going to have to use your initiative a bit when it comes to this tire rack, you won’t mind in the slightest once you have all four of your tires sitting in place. It’s not your average rack, but it’s an excellent option for many. Instead of one big rack, this Pro Space version comes as four tire hooks instead. You install them one by one then hang a tire off each one. The best part is, when you’re not using these hooks for tires, they don’t sit there being useless and getting in the way. You can also hang your garden tools and appliances off them. They each hold up to 110 pounds, but seeing as most tires are around 30 pounds or lighter, it’s clear to see they feature a lot of sturdy steel. 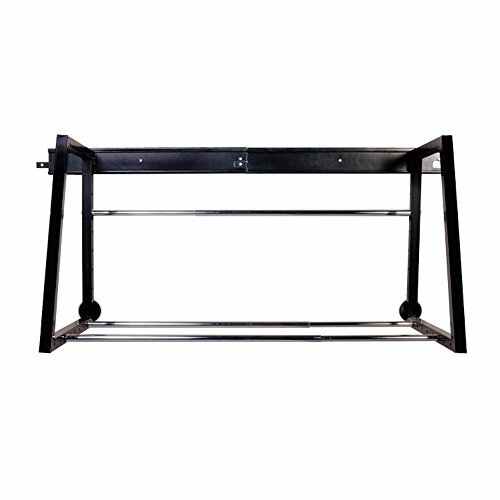 Each component of this tire rack has powder coating to resist rust, as well as arriving with all the mounting hardware you require. However, the bolts are an inferior quality which means you may like to try something else instead. What’s more, the instructions for installation are terrible. You will need to look online or use your initiative. All in all, as far as a tire rack goes, this one is not only different but effective as well. Aside from how much this tire rack protrudes from your wall, you will love everything it has to offer. Produced by SafeRacks, it’s designed to be just that – safe. Instead of inferior installation hardware that often arrives with other tire racks online, this one comes with only the best. You can expect hardened lags, black oxide bolts, and 12-gauge steel with zinc tubing to seal the deal. You may also think that it’s impossible to make a tire rack look attractive, but SafeRacks has managed. The contrasting black powder coating with regular steel makes it stand out from the crowd, all the while serving a purpose in your garage. This rack will hold up to 400 pounds with a four-tire capacity. This means you can always have a spare set of tires at the ready for your ATV, RV, or vehicle. Finally, the price tag is going to appeal too. Even with excellent hardware, superior quality materials and straightforward installation processes, this tire rack still doesn’t cost the earth. There’s every reason to add it to your shopping cart today. 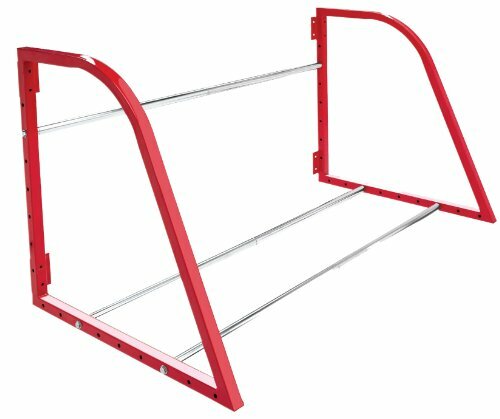 If you don’t have a lot of free wall space in your garage, then this tire rack from Utheing could take care of a lot of your problems. Instead of needing one big area of your wall to be free, this tire rack only needs enough space for one tire each – split into four individual hooks. Each of the hooks has a 50-kilo weight limit – which is more than enough for the average tire. You can then use each tire rack hook for ATV, RV, or standard vehicle tires. You get to keep them off your floor to create more room in your garage. Each hook features heavy-duty steel with powder coating so they won’t rust, as well as arriving with all the installation hardware you need. The hooks are also 14 inches long, broadening the versatility available. Use them for tires, garden tools, or anything else. There is so much you can do with these hooks. There is only one negative point you may like to consider. Instead of installing one rack as is the case with most others on the market, you have to install four individual hooks. As a result, the normal installation time will be longer. You may also struggle to line them up correctly if you are putting them in the same place. This point aside, there’s every reason to consider purchasing this convenient set of tire hooks for your garage or business. If you don’t like a traditional tire rack because it takes up a lot of space, then you’re not alone. A significant number of people would rather pile up their tires in their garage than install a cumbersome shelving unit on their wall. After all, if you’re a bit clumsy, you may smack your head on it as you walk past. Is it worth the risk? However, the problem remains – where are you going to put your tires? FibreHead has a tire rack that’s going to appeal. Instead of a full, traditional rack, it’s four individual hooks that help your tires to sit flush on the wall. You can separate them around your shed to fit in the gaps, or you can install them all together. The depth is only as thick as the tire, meaning it takes up minimal space in your shed. When you buy this tire rack with a difference, you also get to enjoy the industrial-style gray color scheme, set of four hooks, and powder-coated steel. They also have a 120-pound weight capacity which is more than enough for the average tire. While you won’t be able to use this tire rack if you live in a high seismic zone, and you may need to replace the bolts with something better than what they come with, it’s going to pique your curiosity all the same. Even the installation process is straightforward, something that’s not always the case with a regular tire rack. If the time has come to organize your garage or shed a little better, consider looking into these FibreHead flush wheel hangers. You will be pleased you did. If you own a vehicle or a motorized unit with wheels of any kind, then you will have pondered the need for a tire rack at some point – even more so if you like to keep spare wheels on hand. However, before you go right ahead and buy a new rack for your tires, you need to put thought into the type of unit you will need. They are not all the same, and you will also not like all the options available too. Think of these points below before you make a decision. The only tire rack you should be buying is one that features solid steel. Anything less than that will not be able to withstand regular use or even long-term storage of tires. The stronger the iron, the better. Therefore, take a look at whether it has a powder coating or not. Powder coating protects the steel from rusting, and rust can weaken the steel. If it has no powder coating, check out racks that do. Most vehicles, motorcycles excluded, come with four wheels. Therefore, at a minimum, your tire rack should hold four tires. Some are available as hooks so you can buy them in sets of one, two, three, or four, while others are a one-rack setup with room for up to four tires. For commercial configurations, there are even shelving units to hold around 24. Considering you will be installing the rack above your head level, it’s essential that the weight capacity is generous enough for four tires or more. If you have your rack to the absolute maximum capacity, you run the risk of the installation hardware failing which is a significant safety risk. Always opt for the most generous weight rating possible. Think about the room you have in your garage. Some people don’t have a lot of unobstructed wall space, which rules out the average tire rack. You may like to instead opt for tire hooks which can see you dot them around the walls of your garage, putting a single tire where it fits best.